Dogs on the Hill reflect a neighborhood of diversity. Photo by melissajonas. My 8 year old niece was recently visiting from Eastern Washington. One of her favorite things about coming to see us is being able to walk the neighborhood dogs. There’s a 9 year old who visits her grandmother next door, and the girls have become close “vacation friends”. 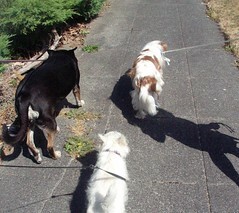 We allow them to take the small dogs around the block alone—reminded each time about safety and sticking together. On our block alone, we have a West Highland Terrier, a Belgian Malinois, a Shih Tzu, a black Lab, a Whippet, a King Charles Cavalier Spaniel, and our mixed breed Tica. If you cross a street in any direction, you’ll meet an English Bulldog, a Catahuoula, a Min-Pin, more Labs… an incredible variety of dogs. My niece is fascinated by the diversity, and loves learning the names of breeds and their history. I share her love of doggy diversity, and have fun watching the big dogs play with the puppies—and how well all the dogs behave around the little girls. Beacon Hill is also an incredible example of human diversity. Staying within one block of our house, you will smell cooking from every continent and hear over a dozen languages being spoken over the dinner table. We have new babies and great grandparents, a wide range of income and education levels, different sexual orientations, and families of every possible composition. Walking the dogs has given me—and now my niece—a chance to develop an appreciation for the similarities our neighbors share. Everyone smiles when they see two little girls holding leashes or selling lemonade. Everyone strives to create a safe, welcoming place. Our neighborhood is a community. 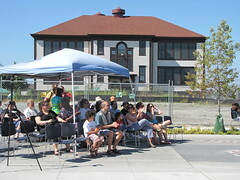 New neighbors are welcomed by those who have lived here 50 years. History, current events, and hopes and fears for the future are all discussed in front yards and on street corners. I celebrate our diversity, and I cherish every chance we have to come together. Beacon Hill has seen many changes over the generations, and we will see more as light rail begins. We’ve weathered several years of construction and traffic challenges, and I expect some bumpy patches as we face increased numbers of people coming through (and moving to) the neighborhood. I’m confident that this diverse, welcoming community will continue to come together to face every challenge and celebrate every positive change.